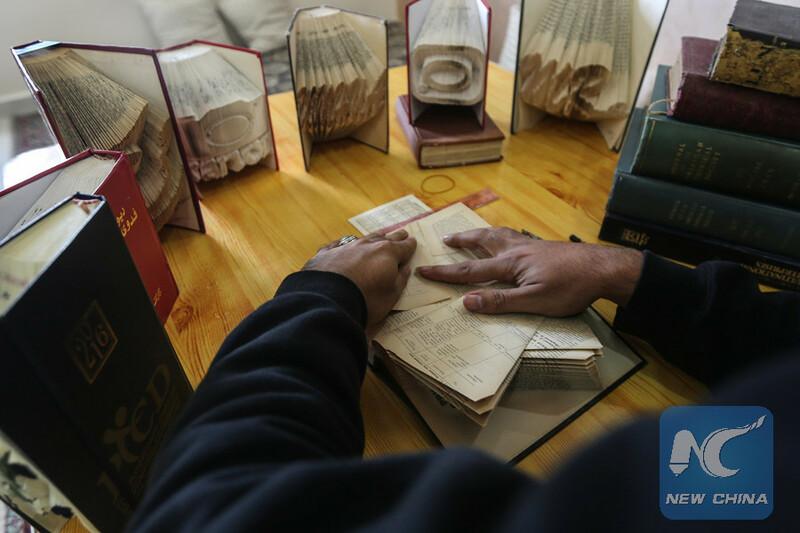 GAZA, Jan. 3 (Xinhua) -- A jobless Palestinian young man from a refugee camp in the Gaza Strip finds a creative way to fight unemployment by learning Origami, or the art of paper folding, online. Ahmed Humaid, 28, creates a variety of interesting shapes and words in both Arabic and English by folding paper sheets. His works have started to attract customers from both inside and outside of the Palestinian enclave. It usually takes Humaid long hours to complete a piece of art at his home in the Nusseirat refugee camp in central Gaza. About a year ago, Humaid learned the art of Origami from the Internet, including some social networking sites. Origami is the art of paper folding, which is often associated with the Japanese culture. In modern usage, the word "Origami" is used as an inclusive term for all folding practices, regardless of their culture of origin. It can transform a flat sheet of paper into a finished sculpture through folding and sculpting techniques. "I began to practice this type of art about two months ago after I spent a long period of time searching and learning its details," Humaid told Xinhua. 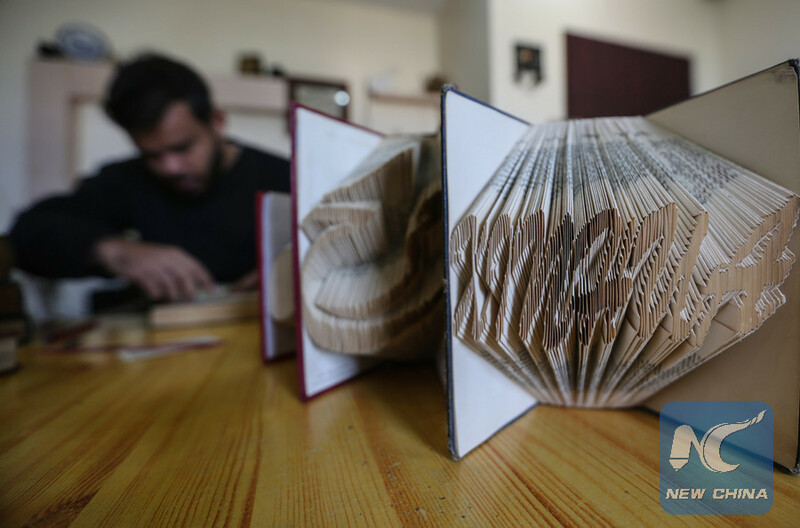 "I sought to present a different art through the presentation of the paper forms in Arabic words because Arabic is my language and because I could not find anyone using Arabic words or letters in the art of Origami," he explained. 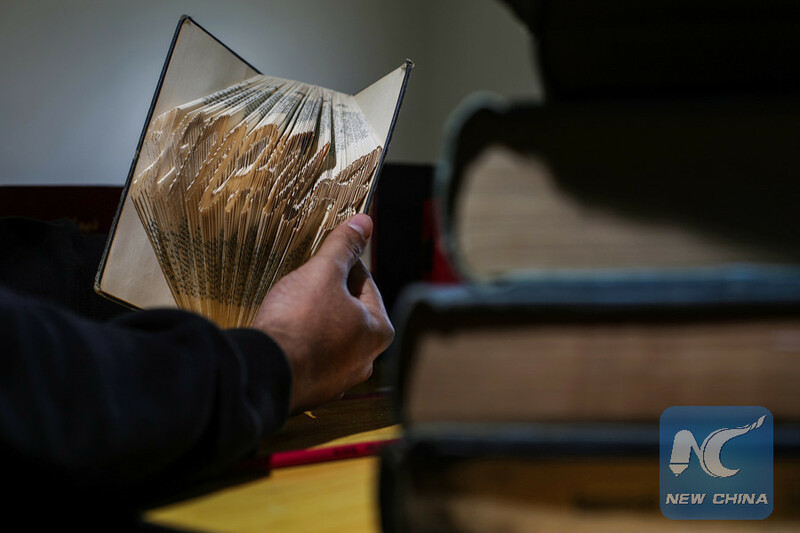 Humaid said that the art of paper folding demands a lot of time and concentration, adding that he prefers to use old book pages because the yellow color embodies characters better than new white papers. "I use computer design programs to make a draft of the Arabic word or logo that I will make," he said. To complete every design needs a certain number of papers, sometimes as many as 300 sheets. Humaid has been making progress in mastering Origami, and now he can create one structure in five hours, which used to cost him more than 15 hours to finish. Just like most Palestinian young people, Humaid suffers from unemployment, which led him to exploit his skills in finding a source of financial income to help his family of six. The price of Humaid's works ranges from 20 U.S. dollars to 50 dollars. The Gaza Strip has been placed under a tight Israeli blockade since the Islamic Hamas movement seized the territory by force after routing forces loyal to President Mahmoud Abbas in 2007. The blockade has pushed the 2 million population in Gaza deeper into dire economic conditions, as the rate of extreme poverty hit 53 percent in 2017 compared with 37 percent in 2011. According to the Palestinian Central Bureau of Statistics, unemployment in the Gaza Strip stands at 43.9 percent, compared with 17.9 percent in the West Bank. Humaid recently began receiving orders from inside and outside the Gaza Strip for creating paper structures in Arabic and English as well as logos for companies. He uses social networking sites to promote his business and sales. But he faces obstacles, most notably the lack of community awareness of this type of art and the lack of old books which he needs for his work. The crisis of power outage in the Gaza Strip, which has been ongoing for several years, is another obstacle for Humaid, who aspires to become regionally and internationally known as a distinguished artist.